128 pages, 15 patterns, color throughout, for quilters of all skill levels. Think about the quilt you are most proud to have made. Remember how rewarding and uplifting it felt to hear your creativity and skill praised as family and friends oooed and ahhhed over your handiwork? 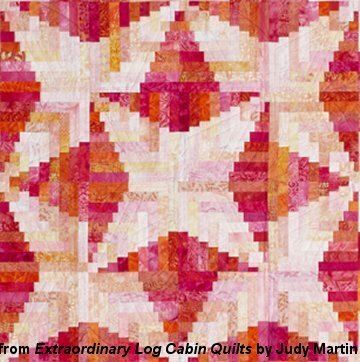 That feeling and more awaits you each time you display the extraordinary quilts you will make from Judy Martin’s newest book, Extraordinary Log Cabin Quilts. This is more than just a quilt pattern book: It’s a way to announce, “I am proud to call myself a quilt maker, and this is how I choose to express myself!” Best of all, as you are basking in acclaim, only you will know how easy these quilts were to make. 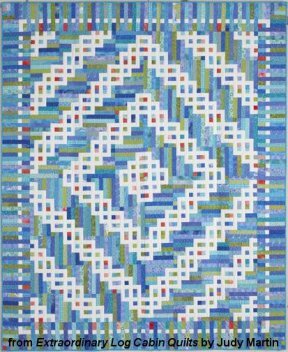 The most extraordinary thing about the quilts in Judy Martin’s new book is that they don’t require any special skills to make. If you can make a straight cut and have an accurate seam allowance, you can make any of the quilts in this book! will help you see the many possibilities for each quilt. 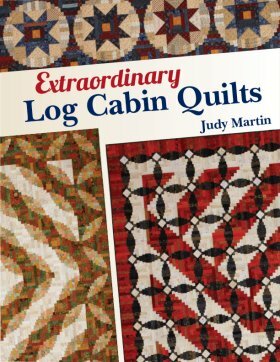 When people think of quilts, they think of Log Cabins; and when they think of Log Cabins, they think of Judy Martin. Only Abraham Lincoln’s name is more associated with Log Cabins, but even he never wrote 3 books on the subject and designed and published 75 Log Cabin patterns, including such classics as Snake River Log Cabin, Colorado Log Cabin, and Wilderness Log Cabin. 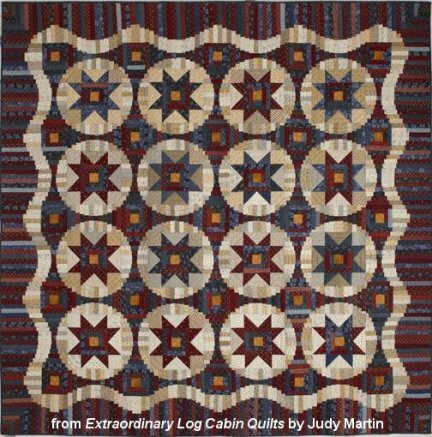 In the 33 years since she published her first book, Log Cabin Quilts, Judy Martin has never put together as breathtaking a collection of Log Cabin designs as she has in her 22nd book, Extraordinary Log Cabin Quilts. color palette. This quilt offers many unique Log Cabin sets. and values in both the darks and the lights makes this quilt sparkle. is achieved with a lattice effect. 12 of the quilts in Extraordinary Log Cabin Quilts are made with nothing more than rectangles. The remaining 3 quilts also add in some patches with 45-degree angles, such as half-square triangles. That’s it. If you can cut and sew straight, you can make these quilts. And if you have had trouble with Log Cabins in the past, Judy offers clear, illustrated instructions on how to achieve an accurate seam allowance because when your seam allowance is right, Log Cabin quilts are a snap. And then, all the quilts you make will be easier and better! 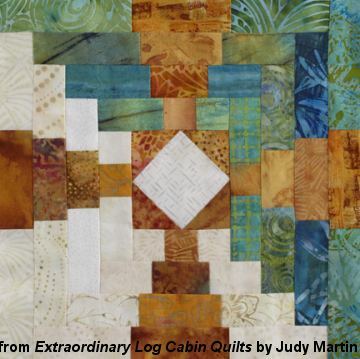 The Log Cabin is ideal for quilters of limited experience. It has basic shapes, simple contrasts, and minimal joints. Quilters love Log Cabins because with the pattern’s many setting possibilities, it’s easy to put your own creative stamp on the pattern. And isn’t that what it’s all about? When you finish a quilt, you want it to be distinctly yours rather than something you see everywhere. Which quilt are you going to make first? 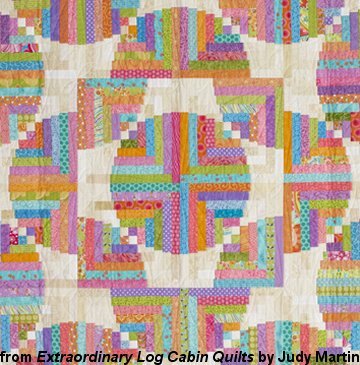 The hardest thing about Extraordinary Log Cabin Quilts is deciding which one you will make first! Take a look and see which designs are calling your name! 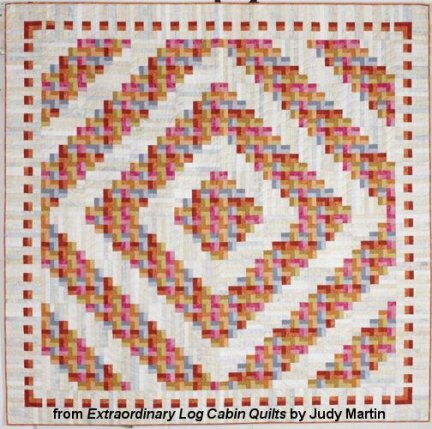 Judy Martin has built a legion of loyal fans because she provides the best value in quilting books. When you buy a Judy Martin book, you can expect more for your money: more extraordinary designs, more available sizes, more useful tips, and more creative ideas. 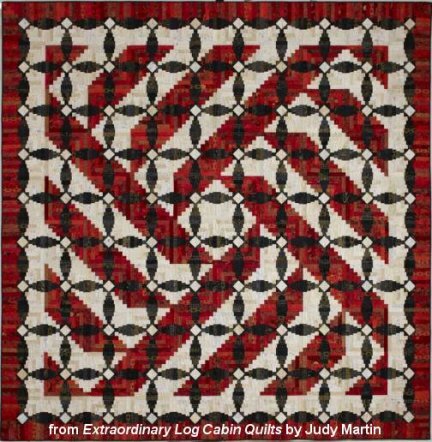 Extraordinary Log Cabin Quilts has more of everything you want, need, and expect in a quilting book. 4 x 4. This quilt is truly extraordinary. These designs just blow my mind! Thanks for the clear instructions and great options for each quilt!! There is no other quilt designer who offers all the needed instructions and required cutting and piecing. The 7 guiding principles represent a great synthesis of what makes quilts extraordinary. I LOVE looking at your log cabin designs! There is always so much to look at, and I especially like your interesting border treatments and the way they complete the inner layouts so perfectly. Your designs are breathtaking and truly inspirational. Who has the time to make ordinary quilts? 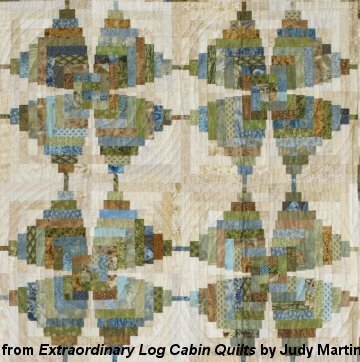 Order your copy of Extraordinary Log Cabin Quilts today and make all of your quilts extraordinary! Civil War reproductions give Main Street Log Cabin a classic feel.